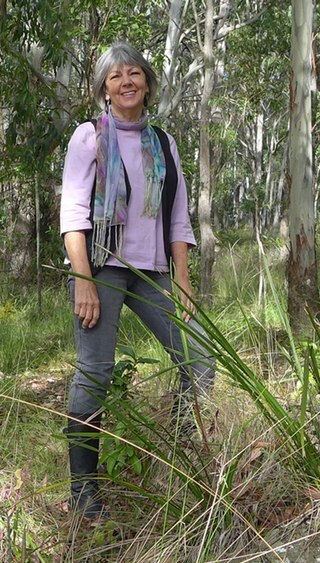 Sharyn Munro lived for decades in a solar-powered mudbrick cabin on her remote mountain wildlife refuge in the NSW Upper Hunter Valley, the heart of her first two books, The Woman on the Mountain (Exisle 2007) and Mountain Tails (Exisle 2009). Mother of two, grandmother of five, concern for their future drives Sharyn to use her very personal nonfiction style to reach beyond the converted. In The Woman on the Mountain, sustainability and global warming concerns mix with memoir, nature writing, and survival adventures with chainsaws or snakes. Threatened species is the theme underlying Mountain Tails, a self-illustrated collection of short pieces for animal lovers. Her short stories have won many prizes, including The Alan Marshall Award; she writes regularly for The Owner Builder Magazine, and her essays have been published in the Griffith Review and famous reporter. The very different Rich Land, Wasteland — how coal is killing Australia (Pan Macmillan/Exisle 2012) arose from her empathy with the people and places of the nearby Hunter Valley being devastated from runaway opencut coalmining. The aim of this self-designated ‘commonsense activist’ is to shock Australians into action, with the truth about coal and CSG. People have compared her book to Silent Spring in its passion, its exposure of issues and the possibility it may lead to a change in the way we treat our world. Thanks for your interest and for helping spread the word about what is happening! Hi Sharyn, I have been following your articles in Owner-Builder Magazine for a few years now, and I am impressed with the publication of your new book about the horrible coal mining industry. Thank you for collating the facts from around our country and hopefully some more people will become aware of the negative aspects and work towards a sustainable future. I will ask my local community centre to purchase your book as I know many locals would be interested in reading it. I wish you all the best, Sandy. Thanks for making contact. It gave me hope to meet people newly becoming active like you two! I am glad my books will help inform you. Thanks for telling me about Adam; we need more good independents. Many thanks for sharing your knowledge and time at Gloucester recently. We are enjoying your books very much and there was much to learn in all of them. We are fortunate to have Adam Blakester as an Independent candidate for New England. Adam has a great record of looking after people and the land. His values meld very well with the theme of the Sustainable Gloucester weekend . It is so nice to have hope. Thank you so much for your care . Thank you for your comments; couldn’t agree more. Many people have given their local MPs a copy. One shocked reader bought 100 copies of the book and sent to 100 politicians, each with a personal letter, so they ‘would know the harm they do’. Who knows how many read it? Professor from Nortodam university given me your book. Every company CEO and general public should read your book. Let’s work together to stop the cause of the illness and environment destruction. Thanks Helen. It was a treat to live on the Mountain and I miss it still. I hope to write a sequel to that book as life rolls on with new challenges! Sharing a love of nature and thoughts about things that threaten it comes easily to me. I’m just always grateful that people like you care enough to read what I write! It was nice to see you and Annie again. Thanks for the kind comment and thought re donations but not really possible to do that. Yes, travel is an issue when you’re on a pension, but often a group will offer to meet my fuel costs if it’s a fair distance, and I usually get billeted. Luckily I’m a very frugal person! I felt honoured to talk with you again after your fabulous moving talk at Gloucester on Saturday! Your stories of community disruption and environmental harm caused by the destructive coal and gas industries deserve to be heard by all Australians, but I know how costly travel is to do so.